An emotional connection at first sight. A shopfront gives a brand a face. We are constantly enhancing that face. Ever larger windows and shopfront heights – along with the skilled use of surfaces, materials and high-impact lighting details – set our clients apart from the masses in today’s central business districts and shopping centres. We work with a wide variety of architectural styles and functional special design elements, such as descending portals, and surprise clients and shoppers with innovative details time and time again. Urban design with a vintage look: specially annealed steel panels with a carbonised look reflect the interior of the store and create a high-end contrast to the fashionable label’s merchandise. Thousands of sparkling sequins and a clever asymmetrical layout set the Glamor Walk shopfront apart. This brilliant design attracts shoppers’ attention to the New Yorker store. 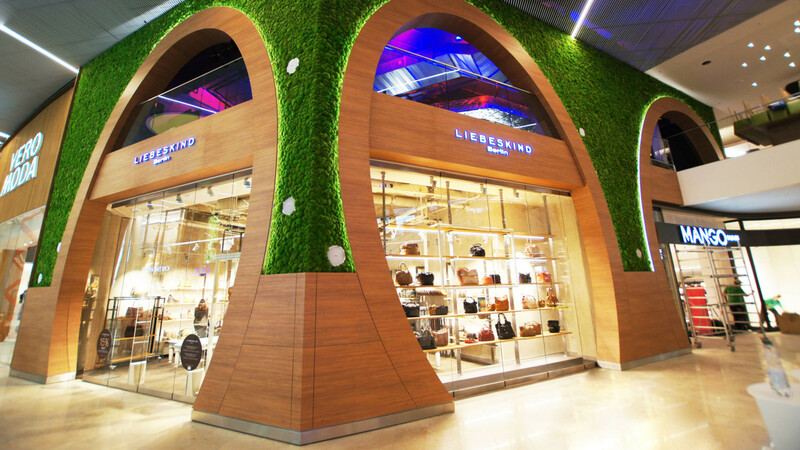 Living moss combines with organic forms and stylish glass surfaces to give shoppers a fresh, natural welcome. The 9-metre Greenpoint shopfront sets the Liebeskind store apart from the competition. 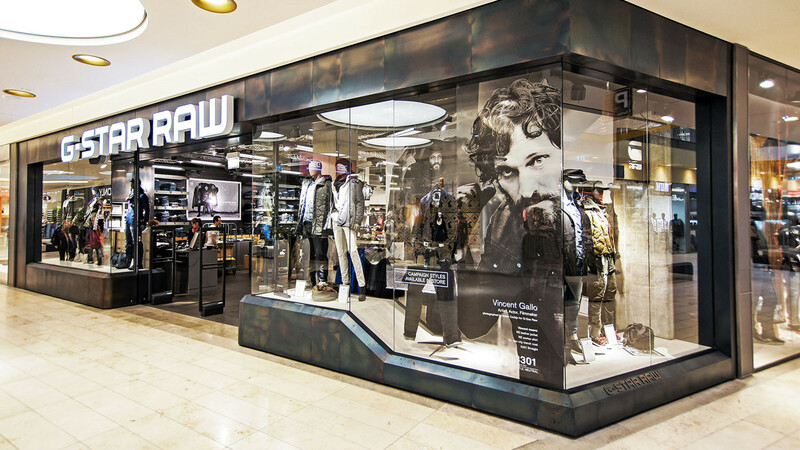 We have seen a tremendous evolution in retail shopfronts in recent years. In your opinion, what are the reasons for this? The design of shopfronts and windows – “the face of a store” – plays a constantly growing role for international luxury labels and premium brands. Here, the task at hand is to communicate the brand’s values to consumers right from the start. 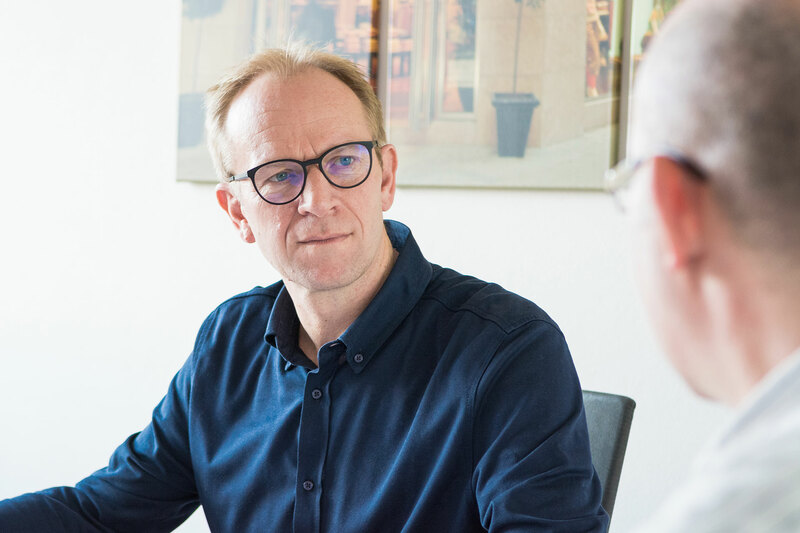 What brands are looking for is a way to visually set themselves apart from the masses in central business districts and shopping centres – and, ultimately, to convey a crucial unique selling proposition and provide an incentive to shop there. Bricks-and-mortar retail also has to find an answer to the constantly growing competition from e-commerce. Customer retention through emotional experiences has grown more important, and visual fascination through exceptional shopfronts plays a pivotal role. How do you approach a project? First of all, we have to listen carefully and understand the concept behind our client’s brand and the messages it is looking to convey. Then it is our job to develop a technical design – the shopfront – that communicates the right emotions. After that, we produce the components, deliver them to the site and assemble them. We provide this service worldwide. Conveying a brand’s values through a shopfront sounds rather abstract. Could you give us a few examples? For one high-end fashion label, we developed an illuminated mesh fabric and integrated it into the shopfront. The fabric builds a bridge to the world of apparel. It is constructed in such a way that it meets the design expectations of the target group spot on. What’s more, walking by it creates a real-life moiré effect that draws attention to the shop. Our solutions for a computer and mobile phone company that consumers love for its minimalistic design are completely different. Here, we have created shopfronts with high, premium-quality glass and stainless steel surfaces that turn heads with their minimalism and strict attention to detail and execution. planbar is known in the industry as an innovative force. In your view, what developments are on the horizon in the years ahead? It is important to our clients to set themselves apart from the competition. That’s why we are always working on new, individual solutions and innovative details. As a result, we are constantly getting better at combining conventional basics with extraordinary materials and surface finishes. In the years ahead, we plan to make even greater use of advancements in profile, glass and LED technology as well as ways of including multimedia in shopfronts. Last but not least, we are building more and more functional special design elements as well as larger and larger glass surfaces.